Rest In Peace Mr. Banks. A true legend, and by all accounts, a gentleman. Born about half a mile from where I'm sitting now. I remember me and a mate playing football on a beach in Rhyll as kidds, and convincing a bloke that Gordon Banks was our dad. The story fell apart when my mates real dad turned up and he looked nothing like him. I saw Gordon play many times, some for England. I had a Mexico replica goalkeepers kit as a kid. I reckon if Gordon had not got food poisoning we would have made the final in 1970. He opened a sports shop near me in the early 70's people were queuing down the street. I got his autograph, a true legend of the game. RIP Big man. One of the true all time greats RIP Gordon. Still sends shivers down my back seeing that save. Also off topic, in 1970 that Brazil team was the best team ever. I met him a few times, really nice guy in the flesh and a GREAT keeper, RIP.
" they think its all over , it is now " RIP mr banks I don't remember too much about the W.c win ,but do recall like it was yesterday the 1970 save ! Last edited by mitch1956; 12th February 2019 at 17:36. The finest goalkeeper we have ever had. As has been mentioned earlier, if he had been fit in that QF in 1970 we would have won the World cup again. Brian Labone was as much to blame..
First goal was Bonettis fault, second was a fluke but Labone could've done better and the third labone left Muller unmarked. Alway brings it home when people you admire from your childhood die. Mainly sports people and actors. Could not agree more! Absolute legend, R.I.P. Gordon Banks OBE. RIP Gordon 'Save of the century' Banks. Top goalie and top bloke. A legend , RIP . 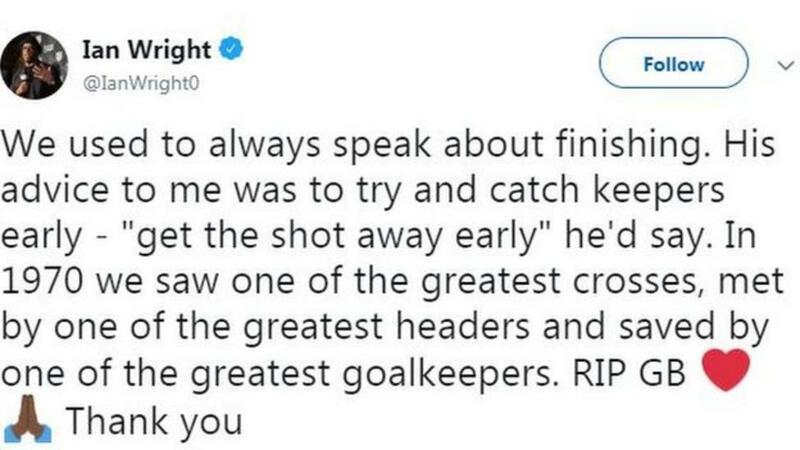 Amazing keeper - my son plays in goal and was upset when he learnt of his passing. True legend of the game and what a save against Pele and the mighty Brazil who were at the top of their game. It was Banksy funeral today and it was lovely to see four young top goal keepers carry him in and out of the Minster.